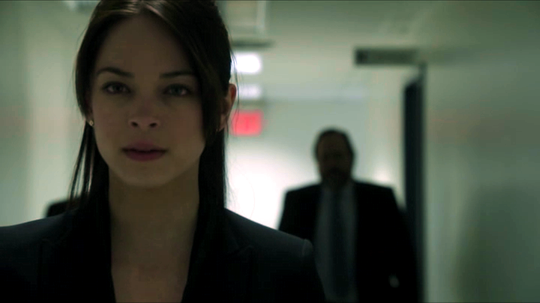 On this episode of BATB we learn that smart terrorists take their hostages to the UN, lawyers can become part of a SWAT team for no apparent reason and that gummi worms are the best cure for depression. Plus we get a visit from our Fanshee favorite Thunder Man, who turns out to be the one honest FBI agent on the show. The episode starts with a panicked Tess storming into THE GUILD, only to find out that JT decided to drown his sorrows [with scotch and gummi worms]. After some not-so-gentle shaking, JT wakes up screaming “get the camel off me!” Tess doesn’t stop to wonder what twisted Arabian-Nights-themed dream she interrupted because she has more pressing concerns: Cat is missing and they need to find Vincent… so he can find her… Not that I am against the idea of finding Vincent, but if they are going to spend all their time and energy looking for someone… shouldn’t they just look for Cat? In any case, JT and Vincent discussed having a rendezvous point if he ever escaped. Planning your fugitive days for over a decade finally paid off. Good planning guys. Now for the not-so-good news. Gabe is taking over the precinct… AGAIN. CAPTAIN WARD [whom I kinda love BTW] is all “I get that you want to catch the dangerous fugitive and all but… why do you have to use my office? Are you a nomad ADA or something?” Of course there is no logical explanation for this other than the fact that BatB has a very expensive precinct set and they are not about to build Gabe a different office… So I guess we’ll just have to deal with the reality of it: EVERY SINGLE LAW ENFORCEMENT OPERATION IN NYC WILL BE COORDINATED FROM THAT PRECINCT. Forever. AT THE DINER OF SECRET BEST FRIEND RENDEZ VOUS, Vincent meets with JT and Tess. Turns out, Vincent has decided to stay rather than run because he can’t leave Cat. Aw. JT is all “Aw… That’s great buddy! You are so totally meant to be together… except for the fact that Cat is missing and we don’t know where she is”. Vincent miraculously manages to keep the Beast in check long enough to realize that he can’t just waltz into Cat’s apartment [to pick up her scent] because the police are staking the place [but they CLEARLY weren’t staking it when Cat was KIDNAPPED. Selective stake-outs are so ineffective… and convenient for plot development]. Next thing we see are a couple of feet walking into Cat’s apartment [is it weird that I could tell from the first second that those weren’t Vincent’s feet?] A million guns are instantly pointed at the intruder… who is JT [shocker… not]. Gabe demands to know Vincent’s whereabouts, but JT only responds with: “Vincent, who?”, which was pretty badass. The cops [and Gabe] drag JT away. As soon as they are gone, Vincent walks in and has the mandatory BEASTMONITION. He is interrupted by Gabe who has returned and, for some reason, thinks he can stop Vincent with a gun. Gabe starts ranting about keeping Cat safe which makes V realize that he is the one who rated him out to the cops. Vincent grabs Gabe by the throat and pins him to the wall. Gabe decides it is a good time to tell Vincent that he WILL catch him and set Cat free or something like that. Let’s look at it this way: Gabe must have a lot of faith in Vincent’s inner goodness or he wouldn’t taunt him like that. Oh, the irony…. BACK AT THE PRECINCT Gabe is treating JT like a terrorist. If you think about it, all he did was walk into someone’s apartment without having a key [the door wasn’t even locked! He can’t even charge him with breaking and entering]. At one point, Gabe tries to win JT over with arguments of “misguided loyalty”; but if someone has a strong moral code it is JT, so Gabe changes his approach and just starts yelling. Tess walks into the room and reminds Gabe that he can’t hold JT with charges of “maybe being a decoy”. JT gets up and leaves. Gabe moves on to threaten Tess. She calls him out on his “beast-hypocrisy” and tells him that he is just a scorned lover. It was about time someone told him that! Meanwhile, Cat wakes up in a prison-like room. A few men enter the room and their leader is AGENT KNOX [who I fondly call THE THUNDER G-MAN]. 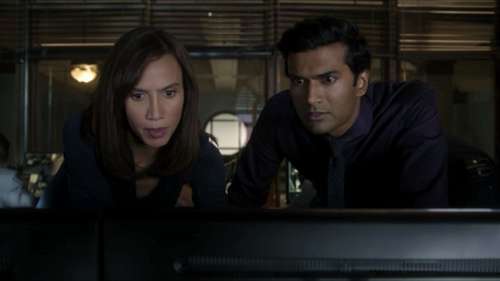 I know most people liked Agent Knox and may were familiar with his previous work, but it was particularly exciting for me to have Anthony Ruivivar on BatB because I am a Beastie who is also a Fanshee! [If you haven’t watched Banshee go binge watch it now because it is seriously awesome]. But, back to business. Agent Knox identifies himself as an FBI Agent. He tells Cat that Dana vouched for her and her “tracking-expert-partner” [was this before or after she went on the WPP?]. Knox reached out to them because he needs help extracting an undercover agent. Cat’s all “yeah… I am NOT gonna buy that”. So Agent Knox tries to sweeten the deal by offering to get Vincent exonerated. This catches Cat’s attention, but seriously… this sounded way too good to be true. Meanwhile, JT and Vincent break into Gabe’s apartment. The plan is to hack Gabe’s beast-alert system, so Vincent can move around freely and find Cat. Vincent points out that JT is risking too much for him, but JT is determined to go in the history books as the BEST FRIEND THAT KNEW NO LIMITS. Hey, we all have our goals in life. Vincent arrives at the WAREHOUSE OF SHOCKINGLY HONEST G-MEN WITH UNKEEPABLE PROMISES just as Cat rejects Agent Knox’s offer [by hitting him with a chair]. She knocks out the FBI MINION too, starts running and bumps into Vincent. But no time for a proper reunion because the two FBI agents have regained consciousness and are after them. Vincat prevail against the LESS THOROUGH LAWMEN EVER by hiding behind a big object. Seriously? A child playing hide and seek would have found them there. But whatever, they exit the warehouse while repeating facts we already know and have the “who should make sacrifices for whom” fight they love so much. Unfortunately, their favorite argument distracts them and Vincent gets caught on tape. The cops [and JT] are immediately alerted. At the PRECINCT, Gabe attacks “talks” to Tess again. He tries to strike a deal by telling Tess that, if Cat comes back now, he will make it look like Vincent kidnapped her [yeah, like Cat is EVER going to go for that]. By the way, it has always annoyed me that Gabe was never nice AT ALL to Tess. Most of the times he treats her like a jerk of a boss and 1) no subordinate deserves that and 2) he should try to be nice to the best friend of the woman he claims to love. Either way, Tess is clearly conflicted and trying to figure out what is the best way to get out of this mess [hint: NOT trusting Gabe]. BACK AT BEAGONSTONE, JT manages to get internet down there. Did they wire the place? Or is there a magical gem for that too? Whatever, they connect just in time to see Gabe’s press conference live. In summary, Vincent Keller is Public Enemy No.1 and Manhattan is sealed. Gotta hand it to Gabe… He sure can coordinate a city-wide man-hunt in record time without even having an office. Vincent proclaims that he “is done running”. He tells Catherine that she can choose to get away from him, but he is not running just to save himself anymore. There is always going to be someone after him and he can’t wait until it is over to be with her because it might never end. Finally he is getting it! He gives Catherine a choice: run or fight? Catherine chooses to fight, which means they have to go back to Agent Knox AKA: their only hope. Cat and Vincent walk into the warehouse and find The Thunder G-man sitting alone and depressed [probably wishing he had some Scotch and gummi worms]. Cat starts by saying “I am sorry I hit you in the face with a chair” and then she looks up at Vincent for approval. He nods. I thought that was crazy adorable. Like a child being forced to apologize [Great example of the actors making an average line sound great]. In the meantime, JT goes all the way to the precinct because he got tired of Tess not picking up his calls [pretty bold, considering he almost got arrested a few hours ago]. Before he can step into the bullpen, Tess traps him in the elevator and asks him to leave. She has completely lost hope for Vincent and doesn’t think there is a way out. 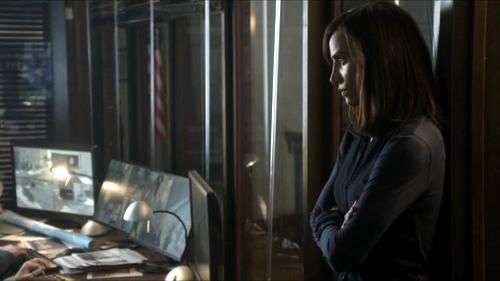 JT tries to brief her on the new plan [fight not run, break into the UN, easy breezy], but she doesn’t want to hear it. She begs him to avoid doing anything stupid and walks away. Cat and Vincent try to come up with a HOW TO RESCUE AN ABDUCTED FBI AGENT IN 10 HOURS OR LESS plan. 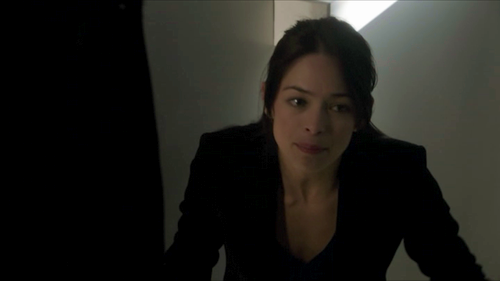 Cat’s bright idea is to get inside the UN and somehow get caught by the terrorists so they put her with Agent Karen and then Vincent can track her. OK… time for me to complain about how this doesn’t make any sense! 1) Cat is convinced that if the terrorists catch her they HAVE to put her in the same room as Karen because “where else would they put her”… she makes that statement just after mentioning WHAT A HUGE BUILDING WITH THOUSANDS OF ROOMS THE UN is! So I’d say the terrorists would have plenty of places to “put her”. 2) Why does Vincent need to track Catherine and not Karen? He has tracked people he never met before… can’t he get a sweater from Karen or something and then just… TRACK HER. Dogs do it that way! But what was I expecting? This is #TrackingLogic after all… Anyhow, Agent Knox gets the [future dated] amnesty and Cat seems satisfied with the document. They finally settle on Cat’s idea to get in for lack of a better plan. Back at the precinct, Tess spots Vincent in a security camera and tells Gabe about it [gasp]. She says that she is “hoping he [Gabe] will protect her friends” [as if!] So Gabe and a thousand cops go to the location where Vincent was allegedly spotted, but all they find is a homeless man. I have question: Since WHEN is Gabe the point man for all police raids? WHY is he running around with a gun!? He is a LAWYER! And he is not even wearing Kevlar! But let’s discuss what really matters; Tess didn’t desert her friends [yay]. While Gabe fails at playing cops and beasts, JT talks to Tess on the phone. He says that “he never doubted her”… [I confess I did for a few minutes… Still thought she was doing what she thought was best, but doubt nonetheless]. Later, when Tess is confronted by Gabe she tells him: “I picked a side, no one is in yours”. Meanwhile, Catherine gets into the UN using the alias KATERINA SORO and then meets with Vincent in the parking lot. He took care of ONE camera and we have no idea what happen to the other 500 or so. Let’s just say he beast-sneaked into the building… Once inside, Cat tells Vincent that they don’t have to go to the terrorists, the terrorists will come to them or something like that. Apparently, Cat scanning her ID at the entrance sent some sort of alert to them… [Fine, that’s hardly the most unbelievable part of the plan so I will buy it]. They go their separate ways and, just as planned, Cat gets caught. She is immediately dragged to the ONE room available for terrorists’ prisoners where she finds Agent Karen. Cat’s all “Hi, I am here to rescue you” [yes, she literally said that], but you can understand Karen’s skepticism. Cat stops in the middle of the stairs because she “needs to catch her breath” and for the love of God I can’t figure out why Vincent didn’t just pick her up! Instead they just have a MEANINGFUL CONVERSATION AT AN INAPPROPRIATE TIME [Aw… they really are back to who they used to be]. Cat doesn’t want to hold him down and be the reason he gets caught blah blah blah Vincent makes it VERY clear that he will never leave her behind. Vincent actually has a plan to get them out, which involves jumping through a window from God-knows-what-floor. Sounds pretty crazy; but, honestly, if Vincent said “jump” I would “jump” so… they jump into the “safety” of American waters. After they afternoon swim, Vincent and Catherine go back to the WAREHOUSE OF UNFULFILLED FBI PROMISES. Agent Knox starts acting all grateful and apologetic which is not a good combination. Turns out that someone got the “Bureau of Prisons” involved and they rescinded the exoneration. Of course they did… this is Vincat we are talking about, stars of the “series of unfortunate events” movie that is their life. But enough about Gabe. Cat goes back to the rooftop and finds her beloved beast. Once again he asks if she is sure about their new “stay and fight” plan. He is “nothing but trouble after all”. Cat tells him she is sure and that secret romances are hot. It’s very sweet and all… but this is like the 10th time they’ve had this conversation in this episode alone! Vincent, Catherine wants to be with you even if she is putting her life/career in danger. Catherine, Vincent would rather stay and be a hunted man than be free and away from you. Are we clear on that? Good… let’s move on. Cat promises that they will have some sort of future together and they kiss. END OF EPISODE. Next week, I will strive to post a recap in the middle of an international 24-hr trip… will I make it on time? Find out. JT: Seriously, you are gonna try to turn me against Vincent? Tess: So now you are the paragon of justice? After everything you used to do? Give me a break. Another great review. Thank you. And I love how you pointed out the plotholes with your special kind of humor - I am still laughing at some of your phrases. 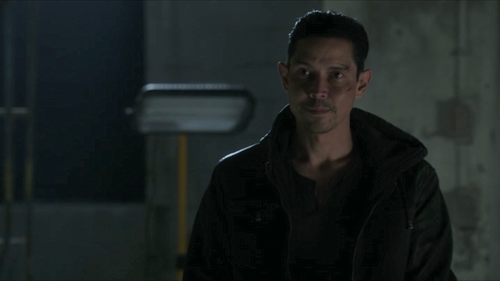 I too like Anthony Ruivivar (saw him in Hawaii Five 0 the other day), but when he first entered Catherine's prison, I thought he was a baddie and that Catherine was going to beat them both up. But when he offered her the water bottle, I changed my mind. The jump from the UN building would not have been so unbelievable if the editor had taken out the aerial shot of it, clearly showing how far the water was away from the building. New Yorkers know this, but at least a lot of other viewers and most international viewers might not have known otherwise. I was aghast when Catherine told Gabe that she loved him and would have glady slapped the writer for that, but maybe it was meant in the way you said it. I can live with that. when JT and Tess meet up with Vincent in the diner, Tess says that Vincent was the last one to have seen Catherine. Well, that is NOT true! After Vincent left, Catherine went to JT to tell him about it and she hugged him, then went home to get herself kidnapped. Now, Tess might not know that, but JT should, since it was the reason why he got drunk. Okay, so let's say he was still befuddled by the drink and the gummy worms. However, when Vincent bumps into Catherine in the warehouse, she tells him that the FBI guys grabbed her right after he left. Huh? SHE should remember when she was abducted. I guess the actors got tired of telling the writers about their mistakes, I mean should'nt THEY know? Maybe that close to the end of the season and possibly to the series, nobody cared anymore, except for the fans. Thank you for your recap, fun to read as always. 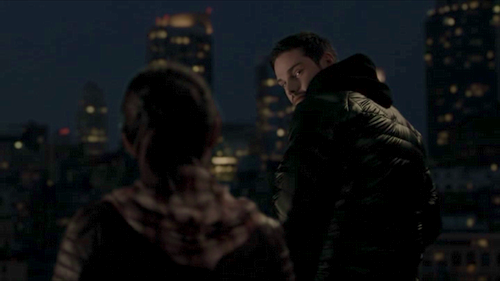 My favorite scene of the episode is when finally Cat trusts Vincent and just leaps out of the building with him. After all her questioning of him throughout two seasons, now she trusts his judgment? She picks a heck of a time. Also, did you notice that Cat went back to the UN for her coat after she jumped from the building? No questions asked apparently. If Tess hadn't blabbed to Gabe that Vincent was on a case to obtain exoneration, Gabe wouldn't have known to block it. I realize Tess isn't a bad guy here, but she certainly isn't the brightest detective on the block. It never occurred to me that Agent Knox and Karen may have been lovers, brilliant observation! there were things I loved about this episode and things I didn't like (as per your review above). I loved some scenes and some lines and did not care as much about others. I felt the writing was somewhat repetitive (as you point out) especially with them elaborating on their relationship. sometimes actions speak louder than words. you've said this 50 times already move on now. oh and yes to anthony as agent knox! need to rewatch banshee before season 3 starts! Honestly, all of these Beast drama sort of bored me.I wanted to see more of Tess,Cat,or even JT but it felt like Vincent was the one who was running the show throughout this season. idk but I want to see others. Hey, thanks for your recaps and comments. They brighten our long months of waiting. Funny that they think Vincent must go to her staked-out apartment to pick up her scent. I'd think he'd know her scent by heart so to speak. After all the reason a dog needs a piece of clothing is because they can't know who they are looking for otherwise. In the case of Karen the abducted agent it would of course be necessary. As you say, the logic of Vincent's powers has never really penetrated into the writers' room. Of course Cath says she loved Gabe just to make him feel bad. Only I would think it would enrage him to hear the one who has jilted him claim such a thing and expect him to be what? Regretful? Of what? Not being a good boy enough? He wasn't the one who broke up and she broke up with him before he was going bad again. Her saying it now is just being a tease. After the high of them getting together in the episode 217 it was obvious that the writers now feel entitled to a rest in the writing room. Or it could be the often stated view in drama writers' circles that after a high must come a low. Neither seems right to me, IMO it is just lazy thinking. Vincent has now decided what he wants and tells everyone so, including Cath, in no uncertain terms while being exquisitely polite as always: "Let me finish." Maybe he is not so polite with Gabe though, which any right-minded viewer finds well-deserved. And the recanting of the written exoneration because it implied guilt that Vincent broke out of jail, that is a circumstantial evidence of guilt in a murder case if ever I heard one. But of course irrefutable evidence of the somewhat less dangerous crime of jail breaking. They can't even call Vincent serial killer/vigilante/murderer in a press conference because he hasn't been convicted, he is only a suspect. But never mind, the writers were simply told to twist the plot key one more turn so that we would be enraged about FBI/Bureau of Prisons(? )/Gabe/Bob treating Vincent so unfairly. I don't know if we ever got to know who it was and I don't think anyone really cares anymore. 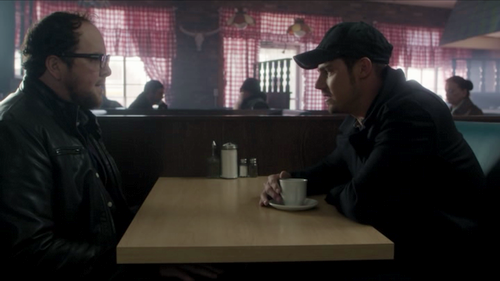 I enjoyed watching Jay Ryan go from hunted, depressed and tormented to a decisive and devil-may-care Vincent, it was a breath of fresh air among the constantly worried looks of everyone in this episode. I enjoyed reading your recap. I agree with your observation about Gabe and his feeling of entitlement especially in season 1. He just came over settled in the precinct and started pushing everyone around and barking orders. He only toned it down in the first half of season 2 but was back to his old self towards the end. Well with regard to his gun wielding antics I suppose anything is possible in TVland. We have seen lawyers, writers, ME's, anthologists, geeks take part in raids in other shows. Anything to move the story along. Its all part of the fun. You have a point about the gun wielding... There are plenty of examples, we have Bones, Forever, Castle, Scorpion.... the UK even has a crime -solving vicar! Thanks for explaining the ILY comment. It was horrifying. And your explanation makes me feel better. I hope the writers clarify it next season. Cat didn't act like she was in love with Gabe. Why have her say that and put salt in the viewers' wounds. I think the writers should have her say in S3 she said ILY to Gabe to make him feel guilty or something. I don't care. I hated that line. Her I cared about yous were bad enough. It can't be canon that she loved Gabe. Plus, she said ILY to V on the roof right after dumping G so logically she must have never stopped being in love with V so she couldn't be in love with G, too. Even if she said she loved him as a friend in S3 sometime or has only been in love with V...I need clarification! I hated it and it was so not necessary. Like it was just so easy not to have her say that...she could have said anything else..or just been like I trusted you and cared for you...and her saying that was so random given how she acted not in love with him...I hated it...I tell myself she meant it how you said. Writers, fix this next season. The only reason for the ILY line seems to be to make Cath look even worse than she already does. Do they want to underline that she is no angel? We know that already. Maybe they think it is a sign of quality to subtly undermine the lead character? Cheap shot, IMO. Not one of my favorites either, but as with any show, they can't ALL be great. You are right about more of a set up ep. for coming eps.